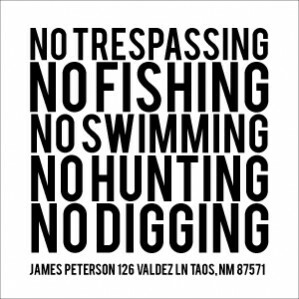 In addition to preventing trespassing, the reasons for using this type of signage can include a desire for privacy, vandalism and theft prevention, preventing hunting, fishing and trapping, and the obvious liability prevention. After all, private property rights are outlined in the Constitution and, for many, evoke some extremely strong emotions. 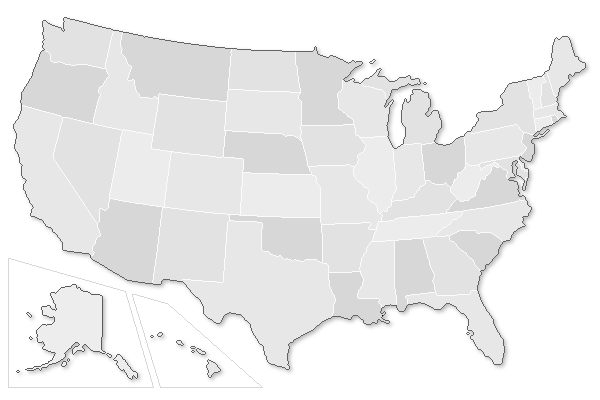 So from no trespassing to restricted access to private property signs, find your state in the map below to see what types of no trespassing signage will give you legal recourse and help protect your property from ignorant or malicious intruders. Trespassing Consequences – Misdemeanor or Felony? 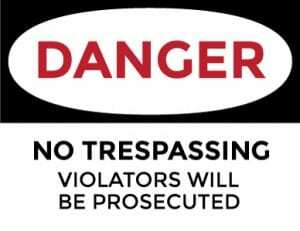 In most states criminal trespassing is punishable by a misdemeanor though in some it is considered a felony. Almost without fail the distinction is based on the situation and intent of the trespasser. Along with being charged with a misdemeanor or felony, trespassing usually comes with some kind of fine and/or imprisonment. In almost all cases property owners have greater legal recourse when they’ve met the state’s definition for proper verbal or written notice. For each state we’ve included examples of the types of signage property owners need to have in place to improve their legal recourse. 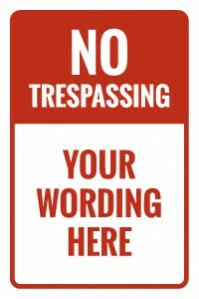 All of the no trespassing sign templates can be clicked on to customize to your state’s needs. Once clicked on we’d recommend choosing our .040 Aluminum material as an affordable yet durable exterior option but rigid plastic and dibond are other good options. As per the note below it is still the responsibility of the buyer to verify that the signage requirement we’ve outlined meets state laws. We’ve done our best to find state laws applicable to criminal trespassing on private property. Some states have trespassing laws specific to the type of property. Where possible we’ve noted these differences. Notwithstanding, we are not lawyers and will not be held responsible for information found on this page. Where possible we’ve included a link to state laws or resources that to the best of our knowledge is current state law. Nonetheless, readers are responsible for ascertaining both the law and source are correct before acting on this advice in any way, including the customization of templates and purchase of signs. 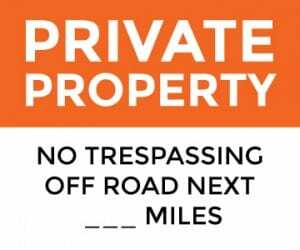 Click on the any template below to customize it or find them in our no trespassing templates page. Alabama’s no trespassing laws state that one can not enter or remain on buildings, dwellings or private property unless authorized to do so. This authorization can be given by the land owner or an authorized representative. Even land that is unused, unimproved and is neither fenced or designed to exclude trespassers is off limits either through verbal communication or posting of signage in a conspicuous manner. 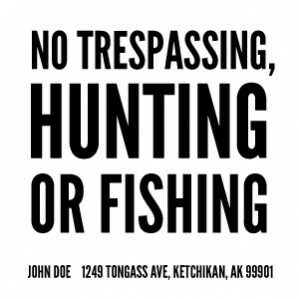 Alaska state laws for no trespassing are laid out in Alaska Statute Title 11 Chapter 46 Section 350, or AS 11.46.350. Notice is given to the person by the owner or by an authorized person that there is no trespassing. Notice is given to the person in a reasonably visible way based on the circumstances. 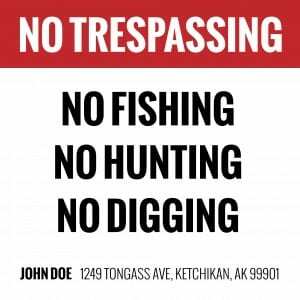 States specific prohibitions such as no digging, hunting, fishing, trespassing, etc. Arizona state laws for trespassing, under AS 13-1502, detail that it is considered trespassing when informed or requested by a land owner, an authorized representative or law enforcement. It is also considered trespassing if “reasonable notice prohibiting entry” has been posted. Definitions of trespassing can be found here in section 13-1501. Under § 5-39-101 and § 5-39-203 Arkansas state law details that trespassing will be considered whenever someone enters and remains without proper consent from the owner, an authorized representative or when there has been notice posted in a conspicuous manner. If the trespassing involves a vehicle or occupiable structure it is considered a Class B misdemeanor, otherwise it is a Class C misdemeanor. California’s trespassing laws are laid out in the California Penal Code Section 602.8. 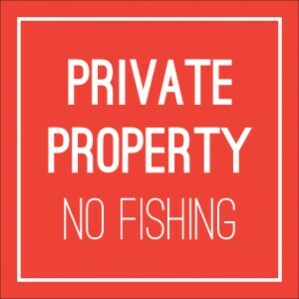 The law states that any person who enters onto private property that is enclosed or cultivated without written permission from the owner or authorized agent is guilty of trespassing. Further, uncultivated and unenclosed land with signs forbidding trespass “at intervals not less than three to the mile along all exterior roads and trails entering the land” is also considered trespassing. Offenders of the same land or contiguous of the same landowner are fined $75, $250 and charged with a misdemeanor for first, second and third offenses respectively. Colorado no trespassing laws are found in Title 18 Article 4 Part 502 – 504 of Colorado’s Revised Statutes. Trespassing occurs when someone “knowingly and unlawfully enters or remains” in or on a property in which they don’t have authorization or license to do so. Trespassing can either be a felony in criminal situations or a misdemeanor in other instances. There is no specific language concerning “posted” signs or proper notice. According to CGS § 53a-109 people are guilty of trespassing in Connecticut upon entering and remaining on land that they know they are not licensed or privileged to be on. This includes activities including hunting, fishing, trapping etc. This is applicable to fenced or enclosed areas or “premises that are posted in a manner prescribed by law or reasonably likely to come to the attention of intruders.” These same considerations also apply to both state lands and near state institutions. Trespassers under these circumstances would be charged with an infraction and levied a fine. Delaware trespassing laws are laid out under Delaware Law § 820 – 829. While there are different levels of criminal trespassing the basic definition is similar to many other states. To point, any person who enters and remains unlawfully without consent from the land owner or an authorized person, or enters on a fenced or enclosed area can be found guilty of trespassing. The difference is that there is not verbiage around unenclosed areas and signage that would still cause trespassers to be charged. In particular this is missing from section 829. Florida trespassing laws are some of the most detailed in the nation when it comes to trespassing and signage. They are detailed in sections 810.011 (definitions) and 810.08 – 810.12 in particular. Florida defines in great detail different structures and circumstances in which trespassing would be applicable. Notwithstanding, it occurs primarily when someone enters and remains without being authorized to do so. It is also unlawful to damage or remove no trespassing signage. (III) Placed at locations that are readily visible to any person approaching the property and no more than 500 feet apart on agricultural land. b. Beginning October 1, 2007, when a landowner uses the painted no trespassing posting to identify a “no trespassing” area, those painted notices shall be accompanied by signs complying with subparagraph 1. and placed conspicuously at all places where entry to the property is normally expected or known to occur. Georgia no trespassing laws are similar to those in many other states. They are detailed in the Georgia Statutes and Codes § 16-7-21 – Criminal trespass. Trespassing is when someone knowingly enters and remains on private property without the proper authorization of the owner or an agent. There is no specific verbiage around posted signage other than violators must have received “notice from the owner’ prior to entry – which if interpreted presumably could mean verbal warning or posted signage. Unlike other states this is unclear. Outlined in §708-814, Hawaii trespassing laws state that a person commits trespassing when they knowingly enter and remain on a property after a reasonable warning by the owner, an authorized representative or law enforcement officer. This is applicable to commercial properties and must be issued within a one year period in which the event took place. It may or may not contain other details as outlined at the link above. 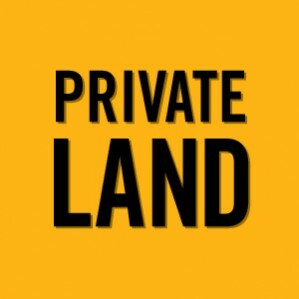 Lastly, unused or unimproved lands needs to have clearly visible signage with some kind of verbiage of “Private Property – No Trespassing” or “Government Property – No Trespassing”. 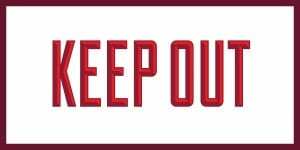 These signs also need to have letters no less than 2 inches high, be visible from outside the property and be placed along the boundaries and entry points. According to Illinois Criminal Code 720 ILCS 5/21-3 trespassing in Illinois occurs when someone knowingly enters without consent or authorization from the owner or an agent. 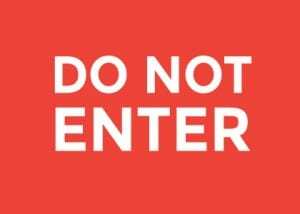 The owner or occupant, amongst other things, must ensure that written notice forbidding entry is posted in a visible way at the main entrance to the land or property or forbidden part. Other markings can include use “purple marks” on poles or trees to prevent trespassing. This is only applicable to municipalities of under 2,000,000 inhabitants. Full details and regulations around this type of marking can be found at the link above. Indiana no trespassing laws are detailed in state code in section IC 35-43-2-2 Version a and IC 35-43-2-2 Version b which deal with the details of criminal trespassing. Violators will be deemed trespassing under a number of different circumstances when they knowingly enter and remain on real property without proper oral or written consent. Specifically, notice can be given by “posting or exhibiting a notice at the main entrance in a manner that is either prescribed by law or likely to come to the attention of the public.” In most cases this will constitute a Class A misdemeanor but can be a Class D felony depending on where the trespassing occurs and whether there have been previous convictions. Trespassing laws for Iowa are explained in Chapter 716 of Iowa Code, specifically section 716.7 defines trespassing. This section lays out all the examples of what can be considered trespassing, even including specific acts such as pursuing animals shot previously on to another property, hunting whitetail deer, etc. In short, trespassing is constituted as entering and/or remaining on property without proper authorization to do so. According to 716.8, which deals with penalties, trespassing constitutes a simple misdemeanor. Depending on what is done during the trespassing incident, violators may be charged with a serious misdemeanor. There is no specific verbiage around posted notice or signage. No trespassing laws for Kansas are explained in Chapter 21 Article 37 of Kansas Statutes and Codes. Specifically 21-3721 details that violators will be found guilty of a criminal trespass, a class B nonperson misdemeanor, when entering and remaining without consent on property as defined in this section. Signage for such laws should be posted so that “such premises or property are posted in a manner reasonably likely to come to the attention of intruders.” Basically, signage need to be clearly labeled and visible to potential intruders to protect your property and have legal recourse. Kentucky no trespassing laws are outlined in the Kentucky Revised Statutes in Chapter 511. Criminal trespass is defined as someone who “knowingly enters or remains unlawfully in a dwelling.” Depending on the situation trespassing can either be a misdemeanor or a violation. There is no specific language around posted notice or signage. No trespassing laws for the state of Louisiana are found in RS 14:63. The law states that no person shall enter or remain on property that they do not have written or verbal communication to be on. The definition of property and specific situations are outlined in full detail in section sixty-three. There is no exact verbiage detailing signage requirements or how it may protect property other than to say that warning can be verbal or written. Which presumably means that signage could be used. Trespassing offenses are punishable by fines and/or jail time and escalate with the number of convictions. Violators are either guilty of a Class D or Class E crime. Trespassing laws in Maryland are under the Criminal Code in §6–402. 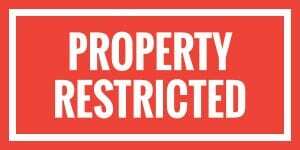 Specifically, trespassers can not enter property where signs are placed in a reasonably visible way. Paint marks on trees or posts at each roadway entrance and adjacent to public roadways, waterways and adjoining land also constitutes fair warning. Violators are charged with a misdemeanor and can be fined and/or imprisoned. Unless noted elsewhere, Maryland has some of the least defined laws in regards to property and trespassing when compared to the rest of the United States. Trespassing laws for Massachusetts are laid out in several different sections of their state laws. In particular, sections 115, 120 and others between sections 120B and 123 lay out trespassing details. In essence, violators can’t enter or remain on property unless they have written or verbal consent to do so. The laws do not state any stringent details for signage except to say that “notice posted thereon” can constitute sufficient notice. Those found guilty can be fined and/or imprisoned depending on the actual offense. Similar to Massachusetts, Michigan lays out trespassing violations in various sections of their law. 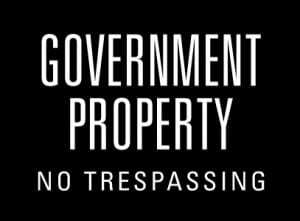 The one most pertinent to private property is found in Section 750.552. This section states that a person can not enter or remain without lawful authority to do so or after being notified to depart. No specific language for signage is noted in this section. Guilty parties are charged with a misdemeanor and may face fines and or incarceration. With some of the most detailed laws, land and property owners would be wise to read these guidelines carefully straight from the source as linked to above. Violators can be charged in various ways depending on the situation. Can be placed on or in the building or part or portion of the forbidden place. In layman’s terms, signage of reasonable size and placement communicating “no trespassing” should be sufficient. Guilty persons are charged with a misdemeanor and can be fined and/or imprisoned. No trespassing laws in Missouri are detailed in sections 569.140 to 569.155. Upon entering and remaining without proper authorization a person is found guilty of first degree trespass. This is considered a Class B misdemeanor. This occurs only when the property is fenced or enclosed in a way to exclude intruders, it is communicated verbally or posted in a manner which is reasonably likely to be seen. So like many some other states a simple no trespassing sign of good size and a clear message will suffice. Similar to Illinois, purple paint to mark streets and posts can also be used and is detailed here. Nebraska trespassing laws are laid out in the 2008 Nebraska Revised Statutes in 28:520 – 28:522. Criminal trespassing is constituted by entering and or secretly remaining in buildings or land that one is not “licensed or privileged” to enter. There are different degrees of criminal trespass in Nebraska as outlined in the sections noted above. Signage, “when posted in a manner prescribed by law or reasonably likely to come to the attention of intruders” elevates the crime to second degree. Thus, visible signage denoting “No Trespassing” ensures that intruders will be subject to tougher penalties. Criminal trespassing laws in Nevada are part of Chapter 207 of Nevada’s Revised Statutes. NRS 207.200 states that anyone who willfully goes upon or remains on land where they not authorized to be is guilty of trespassing and will be charged with a misdemeanor. This occurs after having been warned, which means some kind of generic no trespassing signage needs to be present. Laws for trespassing in New Hampshire are outlined in New Hampshire’s Revised Statutes. The details of the laws are specifically found in Section 635:2. 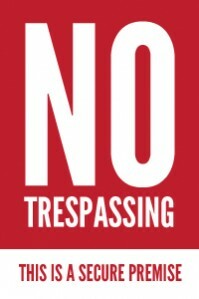 The person is guilty of trespassing when they knowingly enter or remain in any place they are not authorized to be in. Any trespassing in a “secured premises” warrants a misdemeanor. 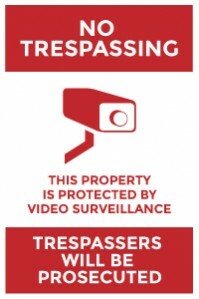 This means that it needs to be fenced, posted, enclosed so as to exclude intruders or have warning that is “reasonably likely to come to the attention of the intruder.” This means that signage can ensure that the property or land is considered a “secured premises.” Subsequent violations of the law will result in a class B felony when the perpetrator causes damage exceeding $1,500 in value. New Jersey trespassing laws are outlined in Section 2C:18-3 of the New Jersey Statutes. Trespassing is defined as someone who “enters or surreptitiously remains” in any building or land that he/she is not privileged to do so. 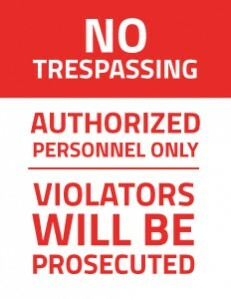 Notice is given by actual communication from an authorized person, fencing or an enclosure designed to exclude intruders, or posting in a way that is “reasonably likely to come to the attention of intruders.” Thus, signage with the verbiage of “No Trespassing” of good size should constitute fair warning. Depending on the facility or land this offense can be a crime of the fourth degree or a simple petty disorderly persons offense. 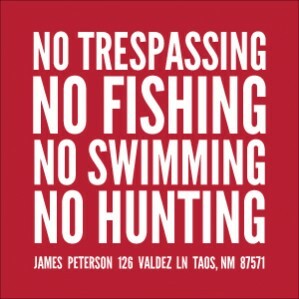 No trespassing laws in New Mexico are outlined in Chapter 30 Article 14 of New Mexico’s Statutes and Court Rules. 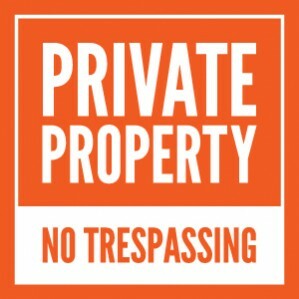 Similar to many other states simple trespassing is defined as knowingly entering and remaining on property without verbal or written permission to do so. Criminal trespassing merits a misdemeanor and can also mean the loss of a hunting or fishing license. Removing no trespassing signage also results in a misdemeanor. The state of New York’s criminal trespassing are detailed in Article 140 within the Penal section of the New York Codes & Statutes. In New York, regardless of intent, criminal trespassing is constituted by entering and remaining when the intruder is neither licensed nor privileged to do so. Signage plays a critical role in trespassing as unposted or insufficient notice can absolve trespassers of guilt in certain situations. Signage needs to be based in a conspicuous manner on the property to ensure that proper notice is given. Based off the circumstances, trespassing can result in misdemeanors of varying degrees and even a felony for the worst cases. North Carolina trespassing laws are contained in Chapter 14 of North Carolina’s General Statutes and more specifically in Article 159. Trespassing punishments vary based on circumstances but the act itself is defined by entering or remaining without authorization. For most situations signage “that is posted, in a manner reasonably likely to come to the attention of intruders, with notice not to enter the premises” is sufficient notice. Though for “posted” property with the intent to prevent hunting, fishing, trapping or the removal of pine needles/straw the signage requirements are much more stringent and laid out below. These are found in § 14-159.7. (1) The owner or lessee of the property may place notices, signs, or posters on the property. The notices, signs or posters shall measure not less than 120 square inches and shall be conspicuously posted on private lands not more than 200 yards apart close to and along the boundaries. At least one such notice, sign, or poster shall be posted on each side of such land, and one at each corner thereof, provided that said corner can be reasonably ascertained. 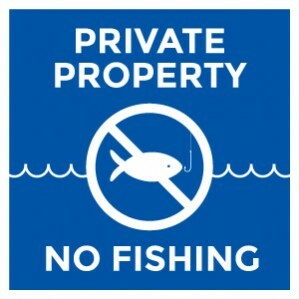 For the purpose of prohibiting fishing, or the taking of fish by any means, in any stream, lake, or pond, it shall only be necessary that the signs, notices, or posters be posted along the stream or shoreline of a pond or lake at intervals of not more than 200 yards apart. Oregon’s trespassing definition and penalties are found in Oregon Statutes 164 under the Burglary and Criminal Trespass section. Trespassing occurs when someone enters and remains unlawfully on a property or premises in which they don’t have permission to be on. Offenders can be found guilty of crimes of varying degrees based on the type of property and situation. There is no specific language on signage, a “posted” definition or proper notice. Criminal trespassing laws in Pennsylvania are found in Title 18 – Crimes and Offenses Section 3503. Pennsylvania’s wording is almost verbatim of many other states in that “a person commits an offense if, knowing that he is not licensed or privileged to do so,” enters and remains on property. Trespassing is contingent on the circumstances and guilty parties can be charged with misdemeanors or felonies. 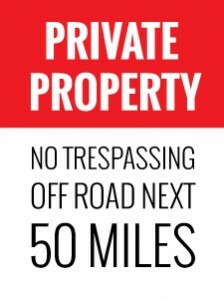 Similarly, wording for signage or “posted” notice is very similar in that it must be “posted in a manner prescribed by law or reasonably likely to come to the attention of intruders.” In other words, make sure to have an obvious sign stating that there is no trespassing and you will have legal recourse. Rhode Island’s no trespassing laws are found in Rhode Island’s Statutes in sections 11-44-26 to 11-44-28. Trespassers are those who willfully trespass and remain on the land with no purpose to do so and lacking permission. This must occur after having been forbidden to do so by those authorized. The statute doesn’t state whether this can be verbal or some kind of written notice but it is assumed that it could be either. Thus, presumably some kind of no trespassing signage that is visible would be sufficient. Penalties may result in a fine of up to $1,000 and imprisonment not exceeding one year, or both. South Carolina outlines its criminal trespassing in its statutes in various places including 16-11-640. In essence they are the same as many of the other states in that a person entering and remaining when having no permission to do so will be guilty of trespassing. Offenders will be subject to varying levels of crimes, fines and potential imprisonment. Tennessee trespassing laws are explained in full in Tennessee Code 39-14-405. 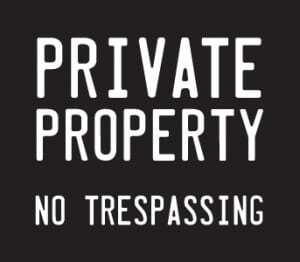 The law states that a person commits trespassing by entering or remaining on property without the proper consent. This offense is a Class C misdemeanor. Signage requirements are that the property owner must have signs that are visible at all major points of access or entry to the property and that they are reasonably likely to be seen by any person entering the property. In most cases guilty offenders will be charged with a misdemeanor. Utah trespassing laws are defined in the Utah Criminal Code in Title 76 Chapter 6 Section 206. Trespassing is the entering and remaining on property without consent. Along with a few other stipulations, notice must be given verbally or “in a way that will reasonably likely to come to the attention of intruders.” Guilty parties will be charged with a class B or A misdemeanor. “signs prohibiting hunting, fishing or trapping where they may reasonably be seen; or (ii) placing identifying paint marks on trees or posts at each road entrance and adjacent to public roadways and public waterways adjoining the property. Each paint mark shall be a vertical line of at least two inches in width and at least eight inches in length and the center of the mark shall be no less than three feet nor more than six feet from the ground or normal water surface. Such paint marks shall be readily visible to any person approaching the property. The Washington Criminal Code contains Washington trespassing laws. Details can be found in Title 9A.52. In Washington, to enter and remain unlawfully without privilege or license constitutes trespassing. Trespassing in such a manner is considered a misdemeanor. Signage plays a key role particularly in situations where land is unused or otherwise not enclosed as notice can be given by being posted in a conspicuous manner. In other words some kind of basic no trespassing sign posted in an obvious and visible manner will be sufficient to give the property owner legal recourse. Wisconsin no trespassing laws are found in the crimes against property section which is Chapter 943. They are specifically found in 943.13 – 943.15. To enter or remain on “enclosed, cultivated or undeveloped land of another…without the express or implied consent of the owner or occupant” is how Wisconsin defines trespassing. In most cases this is considered some Class of a misdemeanor and may involve a forfeiture. Wisconsin gives lots of details on signage in regards to trespassing or “posted” land. “1. If a sign at least 11 inches square is placed in at least 2 conspicuous places for every 40 acres to be protected. The sign must provide an appropriate notice and the name of the person giving the notice followed by the word “owner” if the person giving the notice is the holder of legal title to the land and by the word “occupant” if the person giving the notice is not the holder of legal title but is a lawful occupant of the land. Proof that appropriate signs as provided in this subdivision were erected or in existence upon the premises to be protected prior to the event complained of shall be prima facie proof that the premises to be protected were posted as provided in this subdivision. Property owners must also use a sign that is at least 5” x 7” that is “located in a prominent place near all of the entrances to the part of the building to which the restriction applies or near all probable access points to the grounds to which the restriction applies and any individual entering the building or the grounds can be reasonably expected to see the sign in order to prevent firearms from being carried in various situations and settings.